RenEx Equipment effectively delivers low-friction variable resistance in accordance with muscle and joint function. Designed exclusively for use with the RenEx protocol, RenEx machines are an elegant statement in design and innovation that comes from a rich and storied history. 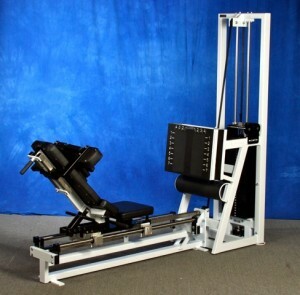 During the 1990s, Ken Hutchins’ original SuperSlow Systems (SSS) machines paved the way for an entirely new model for personal exercise instruction. The machines possessed ideal resistance curves, entry and exit were safer and easier and they permitted numerous adjustments to accommodate a wide range of the population, all while taking up less space. The re-defining New Line had five compound exercise machines: Leg Press, Pull Down, Compound Row, Ventral Torso, and Overhead Press. Whether you sat in the supportive upholstered seats, grasped the firm handles, or secured yourself with the robust restraints, the feeling of being in these machines was unlike anything else. They instantly communicated a tactile sense of ergonomic connectedness. When you finally engaged the movement arm and commenced the exercise, you knew that your workout was about to be profoundly elevated. The Past Helps Form the Future. At RenEx, we used the original vintage line of equipment as our blueprint in developing the new machines. We retained many of the superlative original engineering aspects while reworking others. Elegant new designs and skilled craftsmanship came together to bring innovations such as the UltraGlide® top plate and the Freedom Stack®. Among the more subtle refinements made from the original machines were the new movement arms and handle re-designs on some of our RenEx Machines. In particular, the Ventral Torso and the Overhead Press received makeovers that have dramatically improved the way that these machines operate and feel. In fact, the improvements with the redesigns have been so striking that we have decided to do an unprecedented limited manufacturing cycle to produce retrofit movement arms and handles for the Ventral Torso and Overhead Press, exclusively built for vintage SuperSlow® Systems machines. For a limited time, you can now order these uniquely fabricated retrofits for your vintage Ventral Torso and Overhead Press machines bringing your original models up to RenEx standards! Sharing the distinction of movement arms that arc incongruously relative to the arms and congruously relative to the torso, both the Ventral Torso and Overhead Press machines also require a pelvic coupling to properly load the structures. A partially trunk-flexed body position ensures containment of reactionary forces, greater safety to the spinal structures, and an omni-present feeling of abdominal stimulation throughout the set. Most importantly, these machines permit even grossly debilitated shoulders to perform the exercises. This has been a boon to rehabilitation and progression from morbid weakness to genuine increases in strength for many desperate subjects. 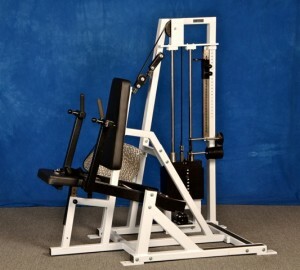 This variation on a chest press machine was furnished with a dependent movement arm that began its arc as a chest press, proceeded into a decline press and then finally concluded rather like a dip. Its handles curved at the junction of the horizontal and vertical parts of the movement arm with a spacing measurement that Hutchins admits has been serendipitously appropriate for a population spread that rivaled his expectations. With the added function of weight stack gapping, shoulder debilities could be handled with even greater finesse and care. But with the design of the RenEx machine, we discovered ways to make the handles of the movement arm far superior to the vintage machine. The new RenEx Ventral Torso movement arm retrofit brings the remodeled handle design of the brand new machine to your vintage model. The retrofit features straight handles that are fully adjustable for width, identical to the RenEx machine. This means that you can more appropriately tailor the hand settings for shoulders of all widths. And the straight handles are easier to grasp than the original curved model with fewer pressure points and less risk of misplacing the hands. Additionally, the new movement arm promotes a depressed shoulder girdle, something that is particularly difficult to teach in this important and basic exercise. With the new Ventral Torso handles you will enjoy being able to move greater resistance with less shoulder strain, improved feeling of the target structures and the ability to customize your workout like never before. Sometimes misnamed “shoulder press,” this machine once faced the ire of many critics who continued to cite incorrect assumptions about the correct spinal behavior for working the shoulder girdle safely in an overhead movement. 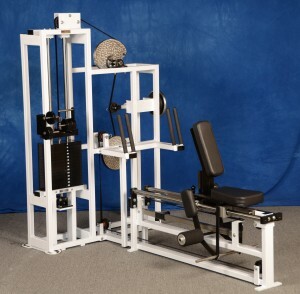 In fact, the SSS Overhead Press is the only machine in the market that places the subject in the correct position to safely load the target structures while providing safety to the spine as well as increasing the use and support of the abdominal muscles. The vintage machine sported two versions of handle types. The earliest iterations possessed a movement arm with straight handles with a later version that had angled handles in a converging effect toward the user. The later version proved to be better on the hands and wrists, and so became the default production design. The new RenEx Overhead Press movement arm retrofit offers a very subtle but critically important design improvement in the orientation of the handles by canting the handle angle upward 20 degrees as well as retaining the inward angle. This very slight adjustment promotes an unusually enhanced feeling during the movement. The hands and wrists are far more comfortable and the effect on the shoulder joint is kinder than any overhead press machine on the market. 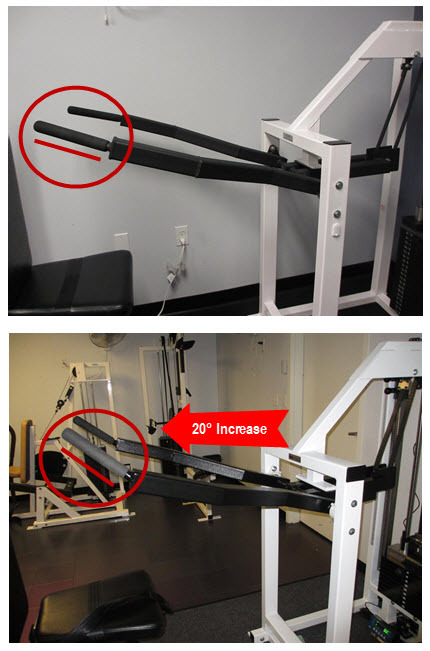 Even subjects with extremely deteriorated shoulders can experience full-range activity on any vintage Overhead Press machine with the new RenEx handle. Additionally, the new handles encourage the most consistent maintenance of the pelvic tilt in overhead press exercise that we’ve ever seen. It simply is far easier for the subject to achieve the coupling effect and sustain it with reduced risk of inappropriate spinal extension. Finally, the new movement arm is better counterbalanced which means an even more appropriate resistance curve. You will move more resistance in better form and fatigue more deeply with this upgrade, guaranteed. The RenEx Ventral Torso and Overhead Press movement arm retrofits allow the vintage machine owner to significantly upgrade his device for a fraction of the cost of a new RenEx machine. All parts are expertly hand-crafted at our manufacturing facility in Orlando, Florida and guaranteed to fit your vintage machine. The parts are powder coated in a gloss black and come complete with all mounting hardware and high quality foam grips. For those who may require them, we can also furnish your movement arms with new Kevlar and/or flange bearings. But don’t delay…First come…first served! For cost and lead-time, please fill out the form below and Josh Trentine will personally contact you within 48-72 hours! Josh are you offering the new upper weight stack plate for SSS overhead press? Designing exercise machines fascinates me you guys have put a tremendous amount of time and own personal experiences into the design of RenEX machines, amazing the attention to the smallest details. The learning curve for you guys in designing the exercise machines must have been a great experience within itself. When you compare RenEX equipment to some of the fad fitness gadgetry their are no comparisons. Most of the fitness “fad” telemarketing strategies are…and it folds away under your bed…once under the bed that is where it stays. hope that it gets forgotten about. Kudos to the RenEx team for getting back to equipment and development.